A new £6 million business centre, providing affordable accommodation for new or small to medium sized businesses, is nearly ready to open its doors. 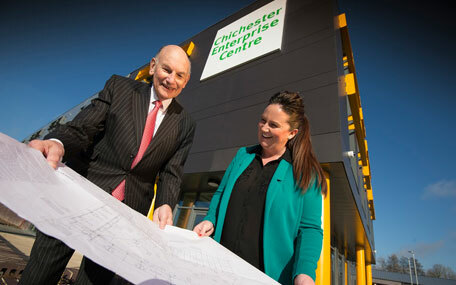 The Enterprise Centre , located in Terminus Road Chichester, has been built by Chichester District Council in order to create jobs and encourage the growth of start-up, small and medium sized businesses in the district. The centre will provide 3,282 square metres of high quality workspace, including serviced and managed offices, workshops and shared workspace in a purpose-built development. The centre offers 82 units in total, including fully functioning offices, studios and workshops, ranging from 12 to 65 square metres. A variety of business support facilities will also be available, including: a reception, breakout area, bookable meeting rooms, telephony, high speed internet and free parking. The centre will offer flexible business accommodation, with a range of options available, from renting a desk for an hour, through to permanent office space. The centre can even offer a business address for new businesses that are trying to get up and running. The aim is to help support businesses in a variety of ways, including working with local education providers and business groups, to offering support and mentoring schemes. Basepoint has been chosen to manage the centre, which will open in March 2018. Councillor Tony Dignum, Leader of Chichester District Council, believes that the centre will have a very positive impact on business growth. "Local business people, both established and those planning to set up new businesses, have told us that they want to see more affordable, flexible, quality business accommodation. In response to this, we have developed the Enterprise Centre, which we believe will help to encourage economic growth in the area. "It is forecast that the project could create around 275 new jobs every three years and contribute to improved business survival rates. In particular, the centre will focus on the needs of small, medium and start-up businesses, with flexible easy-in, easy-out terms. "We are looking forward to working with Basepoint, who will manage the centre on our behalf. They have a huge amount of experience in managing these types of development and have already received a great response from the local business community." Richard Morris, UK CEO, Basepoint, adds: "We're delighted to be working with Chichester District Council on this project as it underpins our shared commitment to supporting small and local businesses. "The Enterprise Centre will be instrumental in providing the flexibility, space and support that local SMEs and start-ups need in order to reach their full growth potential."